The very first home fire I worked on for the American Red Cross was one that killed a grandmother and her grandchildren. I had been with the organization for a week and I was devastated. What I didn’t know was that for multiple reasons, home fires are all too often an intergenerational tragedy. Sometimes it happens because the parents are at work and the grandparents are home with the kids when the fire happens. Sometimes it is because the youngest and the oldest in the house need the most help evacuating. Whatever the reasons, prevention options are clear. In three steps young and old (and everyone in between) can prepare for home fires or any other disaster. The best part is it is something that the generations can do together. 1. Get a kit. Having a disaster preparedness kit both at home and in the car will help to make sure you are ready when the time comes. The kit should be stocked full of three days’ supply of food and water (less is needed in the car of course) along with a battery or hand crank powered radio, extra blankets, toiletries and other essentials one needs when sheltering in place or are forced to evacuate. When packing the kit think about what special needs your family has—diapers and formula for the baby, extra medications and insurance cards for older folks. Packing some games and a few treats (think chocolate and a few good books!) will take some of the fear factor out of the experience for everyone. Plus, having that little touch of home means a lot in case you are living in a shelter or hotel for a few days. 2. Make a plan. Having an evacuation plan to escape your home when there is a fire means the difference between life and death. Know two exits out of every room and have escape ladders installed on the second floor bedrooms. Check your smoke detectors regularly and replace the batteries often. A good rule of thumb is to change the batteries when we change the clocks (November 4th is the next time). In addition to the escape plan, know where everyone will meet after the fire. It could be across the street or at a neighbor’s house. It doesn’t matter as long as everyone knows where to go. Finally, practice your escape plan with the entire family a couple of times a year. Putting the kids in charge of the drill empowers them to take it seriously and helps to take the fear out of the potential situation. 3. Be informed. House fires don’t discriminate by age. We are all at risk of that disaster. But knowing what else can happen where you live whether it is a tornado, hurricane or blizzard is important. And knowing what to do and how to stay safe is essential. More details on all three steps are available here http://www.redcross.org/prepare/location/home-family. Preparedness is for all ages, so all ages can be together without worry. Visit RedCross.org for some great resources about how to keep your family safe. Check out the downloadable Disaster Preparedness for Seniors by Seniors. There is also a great section called Reducing Fear in Uncertain Circumstances directed at helping kids prepare. And of course an entire section just about home fires. Do you have other ideas about how seniors and kids can prepare together? Leave them in the comment section below. Douglas Lent is the Director of Communications for the American Red Cross of the Chesapeake Region. Previously he was the Manager of Communications at Generations United. He and his wife Jaia really do have disaster preparedness kit at home and in the car. For several years, Harriet and her husband took care of Damian. Just before she and her husband completed the process of legally adopting Damian, her husband died in May 2010. The following October, the adoption went through but fortunately Damian remained eligible for survivor benefits. Triple threat Jamie Foxx—singer, actor, and comedian—attributes his great accomplishments to the guidance of his grandparents, Mark and Estelle Talley. They played a big part in his upbringing, taking him in as an infant when his parents split. At every step of the way, his grandparents’ devotion was obvious.When Foxx was in school, they attended the budding athlete’s sporting events religiously; his own father did not, despite living close by. “I was puzzled. Why couldn't he drive 28 miles to check on a son who passed a football more than 1,000 yards?” Foxx questioned. It was his grandparents who cheered him on every step of the way. From the beginning, Estelle Talley knew her grandson was meant for greatness.“ She saw me reading early, saw I was smart and believed I was born to achieve truly special things. She was my first acting teacher,” he recalled in his Oscar-acceptance speech. She also nurtured Foxx’s musical talent, enrolling him in piano lessons at a young age. Undoubtedly these lessons helped Foxx earn his Oscar-winning performance as Ray Charles in the film Ray. keeping with her future goals: she wants to be a college professor and would like to direct a nonprofit that serves young people. Naomi already holds an associate’s degree and is working toward a bachelor’s. Ultimately, she intends to get a master’s in business administration and public administration. For his next birthday, George Arévalo has a simple plan to celebrate. “I’ll be doing what I’m supposed to be doing – taking care of the children.” With his wife Virginia, 77, George has cared for his three granddaughters, ages 6, 12 and 18, for the past three years. George and Virginia depend on Social Security benefits. George was in his 70s when he was told his son and his daughter-in-law weren’t going to be able to continue to take care of his grandchildren. The retired barber and his wife decided they would step in. Virginia suffered a stroke one week after the children arrived. Since then, George acts as the primary caregiver for her and the children. He transports them to appointments, school, and activities. He pushed for the children to attend Catholic school, where they receive scholarships and make good grades. He opened his house to his son when he was released from prison last year. Through the challenges, George maintains a positive outlook. “Right now, we’re doing our best,” he says. The future is hopeful for the Arévalo family. George’s son recently bought a house two blocks away. George mortgaged his own house in order to help his son with the down payment. “I’ve never seen a guy so earnestly dedicated to improving himself,” George says. “That’s why I’m trying to help him. It’s a family thing.” But George will continue to care for his grandchildren. “The children come first,” he says. One of the many lessons we learned from the London Olympics: Never underestimate the power of a grandmother’s love and devotion. That power was on display in the Olympic men’s 400-meter hurdles. It’s what made Felix Sanchez overcome years of injuries and claim the gold medal just a few weeks shy of his 35th birthday. As he ran the most important race of his life, he’d kept his grandmother’s memory close to his heart. Pinned beneath his bib was a photo of his beloved “Abuela,” Lilian Morcelo, the Dominican grandmother who had raised him. After crossing the finish line, he knelt down, placed the photo on the ground, knelt down and kissed it. "It was extra motivation," Sanchez told reporters. "It was a reminder of why I came here and what this year meant to me." The gold medal he won that night in London wasn’t his first, but it was his most memorable. Eight years earlier, at the 2004, Olympics in Athens, he’d struck gold, and expected to do the same in Beijing in 2008. But it was not to be. On the first day of the qualifying heats, Sanchez learned the devastating news that his 72-year-old grandmother had died. Those four years would be filled with hope and punctuated by injuries. But throughout it all, Sanchez kept thinking of that promise and all the sacrifices his grandmother had made for him. "She was everything," Sanchez said. "She was the center of our family and kept everyone together.” She was his inspiration. Along with pinning his grandmother’s photo to his bib in London, Sanchez had printed the word “Abuela” on his spikes. Abuela—Spanish for grandmother and a loving nod to the woman who raised a champion. Our friends at Opportunity Nation are hosting a Week of Action from October 8-15, 2012 to encourage people across the country to increase opportunities for young adults and equip them with the skills they need to compete in the current and future economies. Opportunity Nation has provided a list of suggested actions and invites you to join us in taking part in one or more of the following days of actions. For more information visit Opportunity Nation and be sure to read The Shared Plan to learn more about rebuilding the ladder of opportunity. This resource can be helpful during the Week of Action. For many working families, Social Security provides a much needed safety net against the tragedies of disability and death. 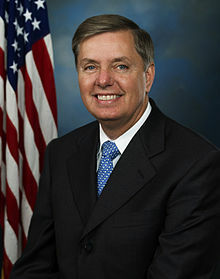 Senator Lindsey Graham grew up in a family of modest means in Central, South Carolina. The first member of his family to attend college, he joined the Reserve Officers Training Corps marking his entry into national service. Several years into his studies, Graham’s family faced a double tragedy. “When I was 21, my mom died,” he said. “She was 52.” The following year at age 69, his father passed away unexpectedly from a heart attack. As a college student, he and his thirteen-years-old sister depended on their recently deceased parents’ Social Security benefits. At the time of her parents’ passing, Graham’s sister Darlene moved in with an aunt and uncle who lived on modest wages from a textile mill. Over the next ten years, Social Security survivor benefits helped feed, clothe, and educate Darlene while Graham completed college and law school. Once his law career got off the ground, Graham became her legal guardian. “I know firsthand that we cannot let the system fail people who need it the most,” he said. Last month, Girl Scouts, Boy Scouts and Daisies in Westchester celebrated Grandparents Day with their older adult friends at the Visiting Nurse Service of New York. Debbie Stricoff, Director of Adult Day Care Services for Visiting Nurse Service, wrote this blog post about the visit. “Sharing Grandparents Day with the VNSNY CHOICE Adult Day Center and some of my scouts was a great opportunity to celebrate grandparents. By using cooking, I was able to bring my great grandmother’s memory to life. I shared her favorite recipes and cookbooks, which she kept dear to her heart. I also shared some of her cooking devices, which helped to spark the seniors’ memories about cooking with their families. “I wanted to share with the seniors that their legacy can continue through sharing their recipes in our intergenerational multicultural cookbook. I never got to meet any of my great grandparents, but through food and stories around the dinner table, I have a very good idea of what they were like. I know so many different cultures through my family. From my mother’s side I know Dominican food. Through my grandfather’s side, I have a taste for his favorite Polish foods, even though I never met him. Thanks to Victoria, the Girl Scouts, Boy Scouts and Daisies – you have added so much to the lives of our members! We can’t wait for your next event! At a Grandparent's Day event at Millenium Park in Chicago, Jumpstart grantees shared information with older adults about upcoming cooking and nutrition classes led by youth for seniors at the Cultural Community Center. On September 10, the White Shield youth held a Family PLUS dinner. The young males made sage bundles and the female youth made traditional cornballs for the families and elders that attended. Some of the youth that participate in the Arikara class at school presented their parents/grandparents with a "memorabilia item" as well. The dinner was held in collaboration with the ladies auxiliary and the local post. On the 9/11 day of service, two days following Grandparents Day, grantees held a tribute to senior adults and talked with them upcoming nutritional classes that will be made available for older adults. The adults were urged to take what they learn from the classes and apply that knowledge when preparing meals for their families and grandchildren. During Grandparents week, young people and older adults visited a nearby senior housing complex and delivered healthy snacks to those living there. Later that week, the youth and volunteer seniors revisited the complex, playing checkers, card games, bingo and spending time with the residents. All enjoyed a healthy fruit cup during the festivities. Our mayor issued a proclamation honoring Our Elders in recognition of Grandparents Day. During Grandparents week, officers of the GrandKids Club from each local high school visited classrooms, encouraging students from all grades to join the club. During the educational session, the club officers encouraged their fellow students to “adopt” older adults from assisted living facilities, nursing homes and independent living facilities. Additionally, on September 8, a group of youth visited a 96-year-old man who had been an adopted grandparent of one of the GrandsKids Club founders. The Mount Vernon Awesome Adventurers 4H Club held a Grandparent's Day Event: Let's Grow Together! The youth invited grandparents and their grandchildren to celebrate Grandparent's Week 2012 at the Hollin Hall Senior Center for intergenerational gardening fun! Activities included painting a rain barrel and mixing soil and plant seeds to start a fall garden. Belton Service-Learning celebrated Grandparents Week with retired teachers and other older citizens in the community. The teachers taught the students how to can food—a lost art among younger generations. The canned food was sold during the students’ homecoming game and the profits were used to help fill the local food pantry. Youth grantees took part in the Intergenerational Community Center Fit kick-off during Grandparents week. The young people talked with older adults about Project F.R.E.S.H. (Food and Relationships for Equitable and Sustainable Health), in which youth will harvest, package and organize the delivery of fresh produce and healthy recipe cards to homebound older adults. The young people also offered several other Grandparents Day activities, including two art projects that encouraged children to make a footprint in sand and a special picture frame for their grandparents to keep. What did you do for Grandparents Day? Tell us about it and we may feature it on the Together Blog! Grandparents Day held special meaning for me this year. Generations United, where I work part-time, expanded Grandparents Day from a single-day event into a week-long celebration. We wanted not only to pay homage to older Americans, but to issue a call to action: ask them to stay involved and continue to share their wisdom and knowledge with younger folks and the community-at-large. During that week of celebration, I also celebrated the life of a dear friend, Lillian Lynch, at a memorial service held for her on September 13. Lillian had died a month earlier at the age of 99. Throughout her long and giving life, Lillian Lynch was a crusader for improving the lives of children and families, especially for those most in need. In the early days of Head Start, she was a board member of the National Child Day Care Association in Washington, DC, serving as the representative of the Washington Urban League. She had strong concerns about the lives of all young children and especially those in the inner city. When she left the Urban League she maintained her board interest, serving on the board for three terms and then as an Honorary Member after being voted in to that spot. Age to her was no factor and she continued to attend meetings and always made comments. In recognition of her devotion and extraordinary service, Nation’s Capital Child and Family Development named a child care center after her. The center was located in the Columbia Heights area of Washington, DC, which is where Lillian served many years in an administrative capacity in a health center. She had several grandchildren and great grandchildren of her own but she was always pleased to visit “her” center where 60 children called her grandma. About a year ago, Lillian told me she did not think she would live to be 100 and she was preparing for her funeral. She told me she wanted me to speak at her funeral and gave me an outline of the service. Six months later, when I joined her as a bridge partner at Leisure World, she reminded me about my commitment to speak and I made an absolute commitment to carry out this mission. When Generations United began planning Grandparents Day, I wondered about contacting her son to post comments on Facebook. However, her illness became too severe and she died August 10. I would like to offer a tribute to a woman who devoted many years of her life serving others and who had a deep love for young children, especially those in need. Her memorial service took place on the morning of the day Generations United sponsored a White House event in celebration of all grandparents. The confluence of those two events—paying homage to Lillian and attending a White House meeting on the same day—were extremely meaningful for me.